So, I've got a storyline presentation with tabs/buttons along the left-hand side. I've got them as hyperlinks from one slide to another with a hover state - nothing else. However, I noticed that while everything works fine if someone clicks the button once - the button will disappear all together if clicked twice. Here's a screen cap to show this in action. This is huge problem for me - any help would be GREATLY appreciated. Thanks! Thanks for the screencast! However, I couldn't see the timeline in the video. Are the buttons grouped together? If they are, it can cause a few issues. If you group buttons, check boxes, or radio buttons together, these interactive objects will not function properly when you preview or publish your Storyline content. In order for triggers to work properly, interactive objects like buttons, check boxes, and radio buttons must not be grouped together. Select the grouped object, and press CTRL+SHIFT+G. Right-click the grouped object, scroll to Group, and select Ungroup. Select the grouped object. Go to the Home tab, click the Arrange button, and select Ungroup. They were moved from slide to slide by CTRL clicking all of them, copying them, and pasting them over. That doesn't group - correct? Grouping takes CTRL clicking them all, then right clicking and selecting that option? I haven't touched the timeline for any of the slides since I want viewers to proceed at their own pace. Would a screencast with timeline shown help? Thanks for getting back to me so quickly! If you'd like to, you can attach your .story file to this message by using the paperclip icon, or send it to me in a private message. I'd be happy to take a quick look and see if I notice anything out of the ordinary. This is Jamie. =-) Your issue is that you have triggers on the buttons that you don't need. You can delete the "change state of button" triggers on all the tab buttons. In the button's states, you have a Hover state already programmed. By default, Storyline will automatically change the button to that state when the mouse is hovered over it. Your trigger is duplicating this action, which I think it what is causing the problem. I deleted a few of those triggers and it no longer had the issue you described. Thanks Jamie! I would have absolutely never gotten that on my own. I appreciate the help from both you and Christine - as well as the great turnaround time that lets me mark this off my "worry about" list before the weekend. Thanks again - hope you both have a great rest of the day! No problem. The beauty of the built-in button states is that you don't need to program triggers to change the state of the button as those built-in states have it already programmed in. The only time you would need to add a trigger is if you want something to happen when the button is rolled over, clicked, etc. 1) The one I recommend - add the text inside of the hover state on the button itself. Keep in mind that you can add graphics, text, etc. to any state. 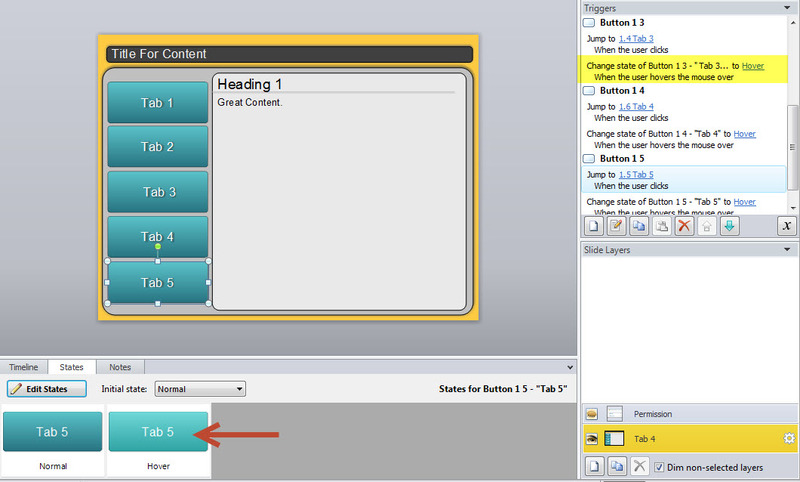 Therefore, the pre-programmed hover state would also show the text box and you would not need any additional triggers. 2) Add a text box to your screen and set the state to be hidden. Then, add a trigger to your button that says to change the state of the text box to normal when the user mouses over the button. Hope that additional information and example helps explain the build-in states and when you'd actually need to add a trigger. "Hi Jaime, This is Jamie. =-) Your issue is that you have triggers ..."